Youth Outreach is tucked away in one of Hong Kong’s many bustling labyrinths of streets. As we climbed the steps to enter the building, we passed posters bearing Dessa’s name and face, tacked to the wall amidst colorful graffiti art. At the top of the stairs stood a bench made of painted skateboards. A stage was set up amid the basketball hoops in the gym. 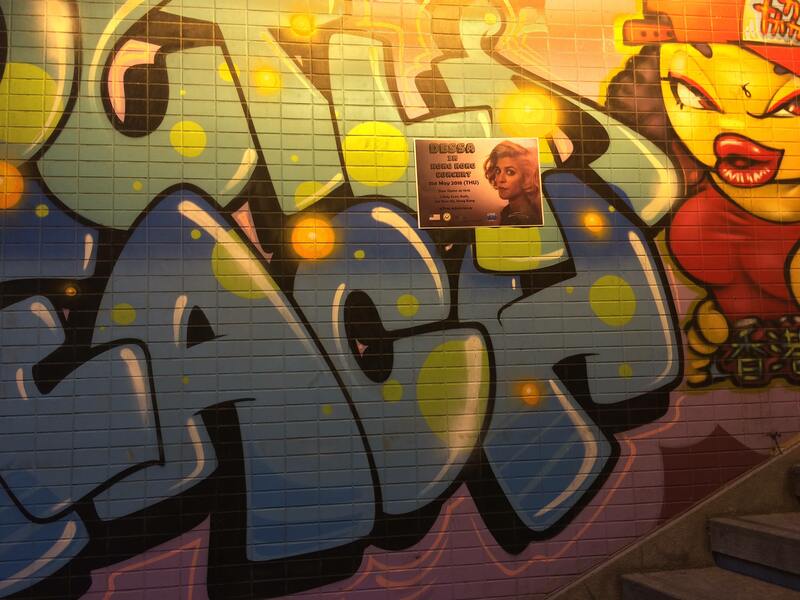 A flyer advertising Dessa’s concert hangs among the graffiti art that decorates the entrance to Youth Outreach. The Dessa in China tour group had arrived in Hong Kong the afternoon of Thursday, May 31, and performed at Youth Outreach that evening. Youth Outreach works to build community among at-risk Hong Kong youth, and Dessa’s concert drew a number of kids from the organization. 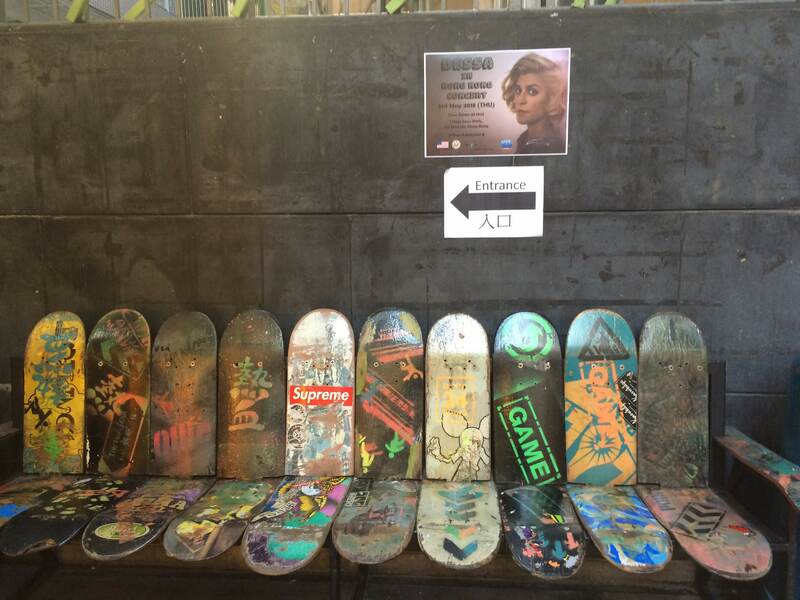 A flyer advertising Dessa’s concert on display above a bench made from decorated skateboards at Youth Outreach. The concert was filled with fans, both old and new: several die-hard Dessa followers came out of the Hong Kong alleys to attend the concert, thrilled with the unexpected opportunity to see her perform. A trio of senior women sat on a bench in the back of the gym between songs—but leapt up to dance along to each number. And at the end of the night, a group of break dancers from Youth Outreach’s School of Hip Hop performed a choreographed dance as Dessa sang “Fighting Fish” to close out the show. Afterwards, she joined the crowd to chat, mingle, answer questions, and take pictures. 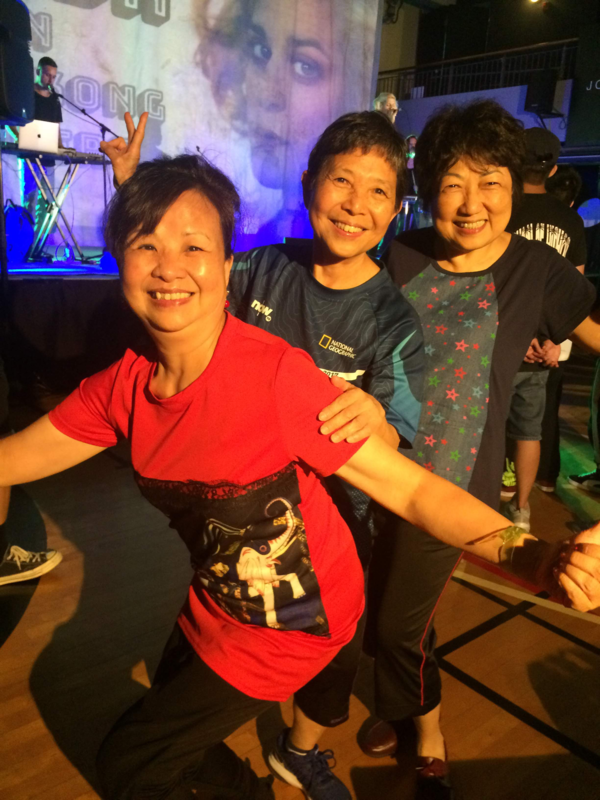 A trio of women took a break from dancing to pose for a photo during Dessa’s concert at Youth Outreach in Hong Kong on May 31. Photo by Emma Bohmann. In many ways, this concert in Youth Outreach, on the second-to-last night of the 20-day tour, encapsulated so much of what the Dessa in China (and Hong Kong!) program was all about. The time spent in conversation with youth and adults alike before and after shows; the excited energy of a room as soon as Dessa entered; the moments of cultural sharing, such as when Dessa asked the audience at Youth Outreach what artists they typically listen to; and the understanding gained, both among Chinese audience members and the American musicians, as they shared their stories with one another—all these are what made this tour special. And as the break dancers and Dessa shared the stage on Friday evening, all these aspects came together in a perfect finale.